Hareidi deputy minister vows no compromise on hareidi IDF enlistment – a hot topic in the 2013 elections. 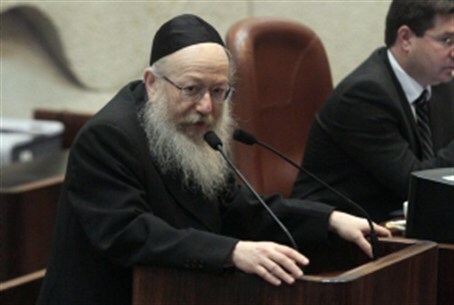 Hareidi politicians will never compromise on IDF enlistment, Deputy Health Minister Yaakov Litzman of the hareidi-religious Yahadut HaTorah (UTJ) party said Tuesday night. Litzman spoke to thousands of members of the Gur Chassidic community, including the Admor of Gur. The government does not actually have the power to force hareidi men to enlist, he declared. “Trying to recruit hareidi men by force – they know it cannot be done,” he said. Hareidi-religious army recruitment has been a hot topic in this year’s election. Yair Lapid in particular has called to “share the burden” by requiring equal army service. Kadima, too, has made the issue central in its campaign with a bus advertisement comparing soldiers’ paychecks to the benefits which some full-time Torah students are eligible for, and an online game in which users “grab the money” to help soldiers.